I like the ISOTONER Signature Women's smarTouch Stretch Fleece Gloves - Fleece Lined in leopard. I really liked the ISOTONER Signature Women's smarTouch Back Gathered Spandex Gloves - THERMAflex Lined. I liked the color and style and I really like that they have smarTouch! I like the ISOTONER Women's Knit Hood Wrap Scarf. I really like the ISOTONER Signature Women's smarTouch Twisted Belt Stretch Gloves - THERMAflex Lined. They look so nice. I like the ISOTONER Signature Women's smarTouch Spandex Gloves. I think these would be my favorite ISOTONER Signature Women's smarTouch Spandex Gloves - THERMAflex Lined, for device use too! I like the ISOTONER Signature Women's Chenille Gloves in camel! I love the ISOTONER Signature Women's Chunky Cable Knit Flip Top Gloves - SherpaSoft Lined! I like the ISOTONER Signature Women's smarTouch Back Gather Stretch Leather Gloves - Fleece Lined. I like the ISOTONER Signature Women's smarTouch Spandex Gloves - THERMAflex Lined! I like the fleece ones in leopard. I like the Isotoner Signature Women's Chenille Gloves=Thinsulate Lined in Cream. My favorite is the ISOTONER Signature Women's smarTouch Back Gathered Spandex Gloves - THERMAflex Lined. I like the ISOTONER Signature Women's smarTouch Back Gathered Spandex Gloves - THERMAflex Lined. My favorite is the ISOTONER Signature Women's smarTouch Back Gather Stretch Leather Gloves - Fleece Lined in red! I like ISOTONER Signature Women's smarTouch Faux Fur Trim Stretch Leather Gloves - Fleece Lined. I would love to have some of the Isotoner women's signature women's microterry spa slippers! I like the ISOTONER Signature Women's smarTouch Sherpasoft Teddy Gloves! I like the ISOTONER Signature Women's smarTouch Sherpasoft Teddy Gloves in Pink. The Back Gather Stretch Leather Gloves are pretty. ISOTONER Signature Women's Knot Leather Gloves - Fleece Lined would be my favorite. My favorite is the Signature Women's smarTouch Studded Belt Stretch Leather Gloves. ALONA Y.
I like the ISOTONER Signature Women's smarTouch Leather Gloves - Fleece Lined! I have had several pairs of Isotoners and they are fabulous too! I like the ISOTONER Signature Women's smarTouch Stretch Fleece Gloves - Fleece Lined because I can use them with my smartphone. I love the ISOTONER Signature Women's Moccasin Stitch Suede Gloves - Sherpasoft Lined. I like the ISOTONER Signature smarTouch Spandex Gloves with THERMAflex Lining . It looks so warm for my handsicles! I love the Smartouch gloves in red. Fleece lining would make these so soft! I like the ISOTONER Signature Women's smarTouchBold Check Stretch Gloves - THERMAflex Lined. ISOTONER Signature Women's smarTouch Faux Fur Trim Stretch Leather Gloves - Fleece Lined are my favorite. 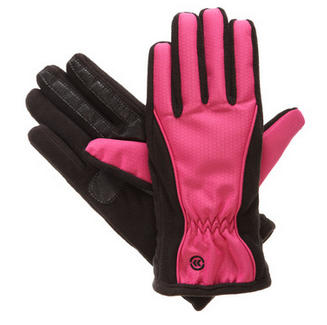 I like the ISOTONER Signature Women's smarTouch Matrix Nylon Gloves - THERMAflex Lined, in the pink and black! :) They look so warm and it is so very cold right now. I like the ISOTONER Signature Women's smarTouch Studded Belt Stretch Leather Gloves - Fleece Lined. I love the ISOTONER Signature Women's smarTouch Sherpasoft Teddy Gloves in pink. I really like the ISOTONER Women's Unlined Shortie Spandex Gloves in black. I think these gloves are really pretty and warm ISOTONER Signature Women's smarTouch Leather Gloves - Fleece Lined. I like the ISOTONER Signature Women's smarTouch Spandex Gloves withTHERMAflex Lined. My favorite glove is the Nordic Fairisle for Women. Love that design. There are so many beautiful items on the website, but if I had to select just one, it would be the ISOTONER Signature Women's Chunky Cable Knit Flip Top Gloves - SherpaSoft Lined....love them! I love the ISOTONER Signature Women's Nordic Fairisle Gloves. I like the ISOTONER Fingerless Therapeutic Gloves. My right hand is really messed up from a car accident and sometimes it really aches. Especially when I'm on the computer too much! I love the ISOTONER Signature Women's smarTouch Basket Weave Bow Gloves. They are so classic, they would go with anything. I like, the ISOTONER Signature Women's smarTouch Stretch Fleece Gloves - Fleece Lined, in Leopard. I like these gloves the best: ISOTONER Signature Women's smarTouch Leather Gloves - Fleece Lined in Black. They cost $62. My favorites are the ISOTONER Women's smarTouch Contrast Matrix Nylon Gloves - with THERMAflex Lining in charcoal! My fave: Signature Women's smarTouchBold Check Stretch Gloves. I like the ISOTONER Signature Women's smarTouch Stretch Fleece Gloves - Fleece Lined in Multi Dot or Leopard. I really love the ISOTONER Signature Women's smarTouch Chevron Spandex Gloves - Fleece Lined! They sound very warm! I have this love of Leopard so I would love Women's smarTouch Stretch Fleece Gloves - Fleece Lined. Thanks for the chance to win. Isotoner has a product unlike any other, and they make a great Christmas gift for just about anyone. My favorite Isotoner glove is the ISOTONER Signature Women's smarTouch Softshell Gloves in white. I like the Nordic Fair Isle gloves. I like their ISOTONER Men's Woodlands Check Trapper with Faux Fur Hat for my hubby! I love the pair you reviewed, ISOTONER Signature Women's smarTouch Matrix Nylon Gloves - THERMAflex Lined in Very Berry of course and I also loved the ISOTONER Signature Women's smarTouch Spandex Gloves - THERMAflex Lined. Isotoner gloves are so useful as it is freezing already in Georgia! I like the ISOTONER Signature Women's smarTouch Spandex Gloves - THERMAflex Lined. These gloves look comfortable and not at all bulky. I went to the Isotoner website and found my favorite Isotoner glovers. My favorite gloves are the Fingerless Therapeutic Gloves because they would be great for my arthritic hands and keep the swelling down. I really like the ISOTONER Signature Women's smarTouch Spandex Gloves. My favorite are the Signature Women's smarTouch Faux Fur Trim Stretch Leather Gloves - Fleece Lined. I love the fur on those. I like the: ISOTONER Signature Women's Nordic Fairisle Gloves. I like ISOTONER Signature Women's Knot Leather Gloves - Fleece Lined - in black. isotoner womens smartouch leather gloves fleece lined in black. All of them are nice gloves. I like the women's knot leather gloves! I wish they rated them for warmth, I guess it would be ISOTONER Signature Women's smarTouch Leather Gloves - Fleece Lined. I really like the ISOTONER Signature Women's smarTouch Stretch Fleece Gloves - Fleece Lined. I like the ISOTONER Signature Women's Nordic Fairisle Gloves. I love the women's smartouch leather gloves in grey, they are just beautiful! ISOTONER Signature Women's smarTouch Marled Cable Gloves - THERMAflex Lined is either my top or 2nd pick. I'm a little iffy about the one thick cable down the center - it makes me think the gloves have a mohawk! ISOTONER Signature Women's smarTouchBold Check Stretch Gloves - THERMAflex Lined is the other pair I'm interested in. I love that smart touch technology is getting used so much more now. I can actually buy gloves that cover my fingers and still be able to use touchscreens!! I am in love with the ISOTONER Signature Women's Chenille Gloves - Thinsulate Lined in Ivory! I like the ISOTONER Signature Women's smarTouch Marled Knit Gloves. I am so happy isotoner came out with the smarTouch gloves. I've been wearing Isotoner gloves for years. I really love these gloves http://www.totes-isotoner.com/isotoner/product/isotoner-womens-smartouch-leather-gloves-56763.do?sortby=ourPicks so beautiful! I like the women's smaTouch chevron.spandex gloves. I really like the ISOTONER Signature Women's smarTouch Basket Weave Bow Gloves. They would match one of my coats perfectly. I like the smartouch gloves! I love the ISOTONER Signature Women's smarTouch Back Gather Stretch Leather Gloves - Fleece Lined in red. I love the ISOTONER Signature Women's smarTouch Faux Fur Trim Stretch Leather Gloves - Fleece Lined. They would be perfect up here for the winter!! My favorite is the mens ultradry waterproof sports gloves with the fleece lining. I love the ISOTONER Signature Women's smarTouch Studded Belt Stretch Leather Gloves - Fleece Lined. For everyday wear I also like the ISOTONER Signature Women's smarTouch Chenille Knit Gloves in Deep Purple or Magenta. I like the SmarTouch twisted belt stretch gloves with therma flex lining. My favorite is the ISOTONER Signature Women's smarTouch Topstitch Stretch Leather Gloves - Fleece Lined gloves. My favorite gloves are the Hybrid Convertible Fingerless Gloves in Black/Oxford Heather. I like the Signature Women's SmarTouch Contrast Stitch Spandex Gloves. My favorite is the ISOTONER Signature Women's smarTouch Faux Fur Trim Stretch Leather Gloves - Fleece Lined! I like the ISOTONER Signature Womens Nordic Fairisle Gloves. I like the Isotoner studded belt stretch fleece lined gloves. I really like the ISOTONER Signature Women's smarTouch Sherpasoft Teddy Gloves. I love the ISOTONER Signature Women's smarTouch Matrix Nylon Gloves - THERMAflex Lined in black! My favorite is the ISOTONER Signature Women's Moccasin Stitch Sherpasoft Lined Suede Gloves . My favorites are the ISOTONER Signature Women's smarTouch Topstitch Stretch Leather Gloves - Fleece Lined. I like the ISOTONER Signature Women's smarTouch Duo Stripe Knit Gloves.